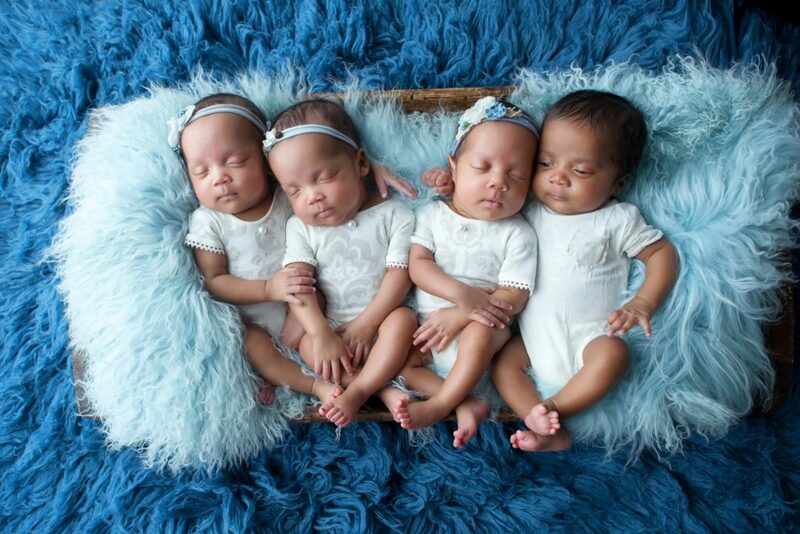 A mum whose life was saved by a miscarriage which revealed deadly bladder cancer thought she would never have kids after losing both fallopian tubes – but has now given birth to miracle QUADRUPLETS. Virginia Johnson had her right fallopian tube and ovary removed aged 13 and was heartbroken when, in October 2013, doctors revealed her first pregnancy was ectopic and would have to be terminated. A scan to observe the pregnancy then found a tumour growing on the 35-year-old’s bladder and medics were forced to remove her other fallopian tube to save her life and prevent it from spreading. After this Virginia gave up hope of ever having a baby but after giving birth to daughter Zoey in October 2014 via IVF she decided to give the treatment one last try to give the three-year-old a sibling. 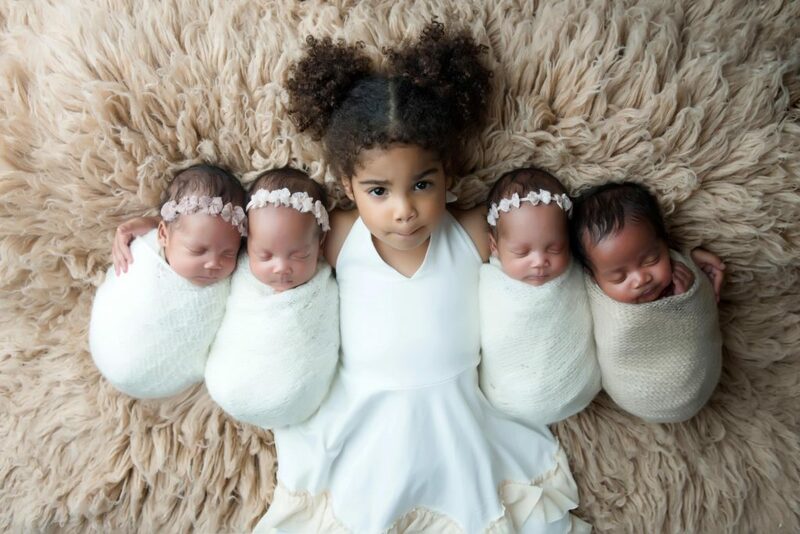 And against the odds, the loan coordinator discovered she was carrying quadruplets and has now racked up thousands of social media fans of her insights into life with Zoey and Ava, Madelyn, Olivia and Victor, all eight months. Virginia, from Arizona, USA, said: “When doctors discovered the cancer I was so broken. After trying to have a baby for long, we were just so incredibly happy to have conceived naturally. “And then boom – two weeks later it was all taken away from us. “I was incredibly angry and severely depressed. It took me a long time to realise that the ectopic pregnancy happened for a reason. “It was like my body saying, ‘don’t worry, you are going to be a mum but not yet, your body isn’t ready, let’s beat this cancer first’. “After removing the ectopic pregnancy, they couldn’t save my fallopian tube, so I knew it would be impossible to conceive naturally after that. “Then all of a sudden I had bladder cancer. I couldn’t believe it. 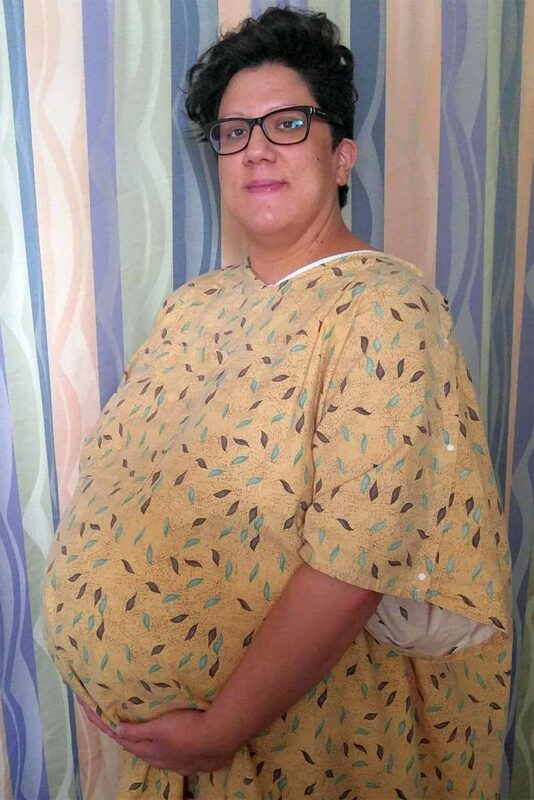 Virginia and service technician husband Victor, 45, had tried to get pregnant for years and battled against an onslaught of fertility issues that had plagued Virginia since she was just 13, when her right ovary and fallopian tube were removed because of complications with PCOS (Poly Cystic Ovary Syndrome). After the internal scan to observe her ectopic pregnancy revealed the malignant tumour, this was removed in November 2013. If the pregnancy had not been ectopic and had proceeded as normal, doctors said that Virginia’s bladder cancer would have most likely gone undetected and spread throughout her body, eventually killing both her and her unborn child. With no fallopian tubes and just one ovary left, Virginia and her car dealer husband Victor decided to pursue IVF straight away in December 2013 in the hopes of being able to start a family. Virginia revealed the swift dive into IVF was “a coping mechanism” and a way to “numb the pain” of the couple’s sad loss a month earlier. Fortunately, the couple’s luck turned around when they discovered the treatments had worked and they were pregnant with their first daughter Zoey, who was born in October 2014. After an “incredible” year and a half of being brand-new parents to Zoey, Virginia said she began to feel clucky and couldn’t fight the urge of wanting to hear “the pitter-patter of little feet”. But what the couple didn’t know was that this pitter-patter would be a stampede. 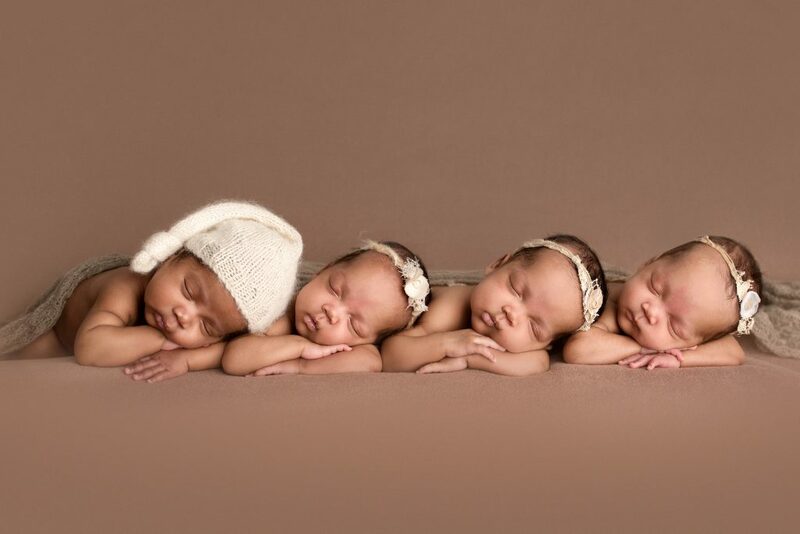 Ironically, after the first round of IVF the couple only chose to transfer one embryo because of the risk of multiples but sadly, it didn’t make it. 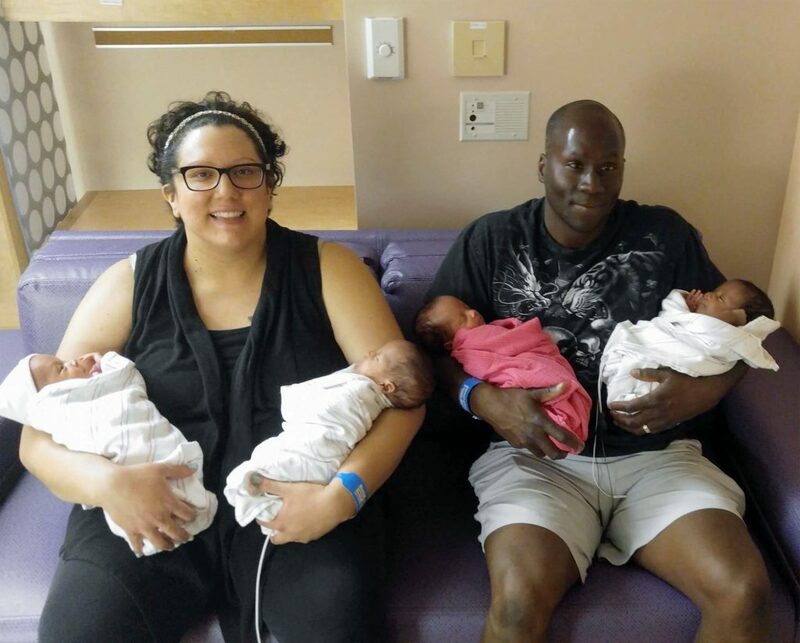 Despite feeling down about the loss, Virginia decided to try again and transfer two embryos and this time, both were successful, and the couple were told they were having twins. At a scan one week later, Virginia’s doctor informed her that one of the two embryos split into two and that she was having triplets. 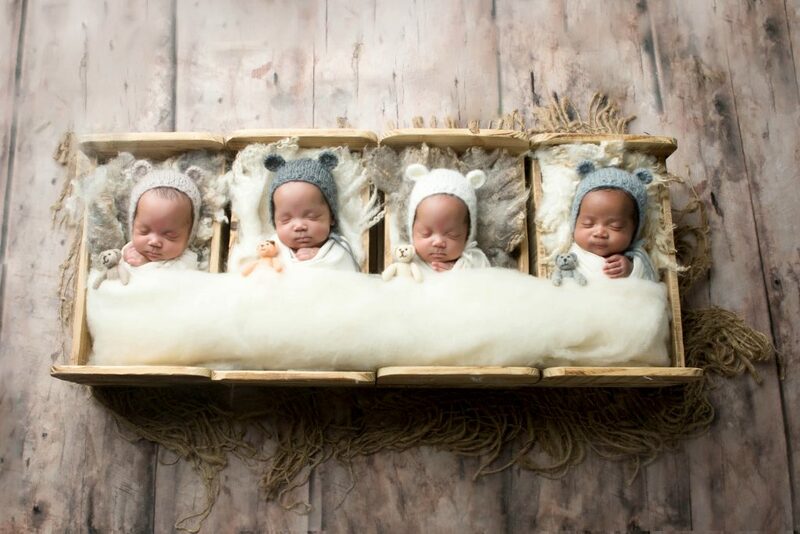 In an incredible turn of events, two weeks later Virginia’s doctor discovered that there were actually two babies sharing one sac and that she was pregnant with quadruplets – three identical girls and a boy. Virginia said: “It was such an emotional rollercoaster. I went from being excited for twins, to being overwhelmed at the idea of triplets and then being completely gob smacked that I was pregnant with quadruplets. “Straight away, my doctors warned me about the dangers of carrying quads and asked me to consider ‘selective reduction’, meaning to abort one or more of the babies. “But that was never an option for me or my husband. 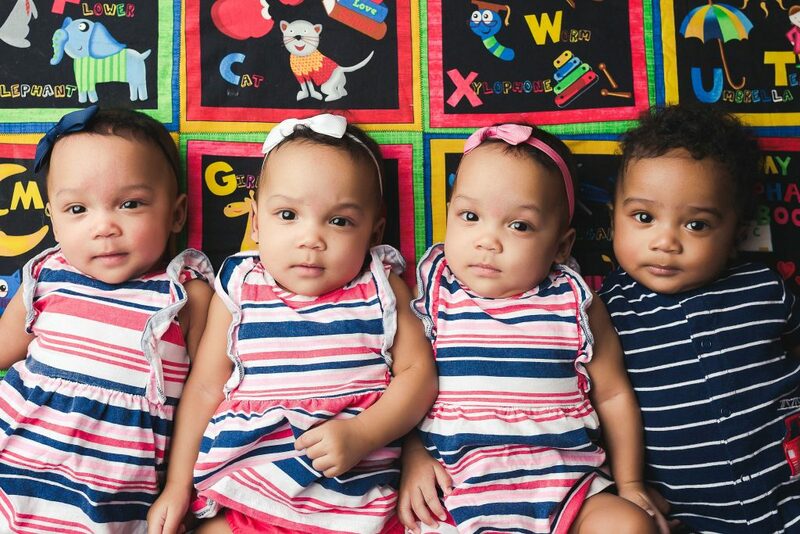 Virginia carried her quadruplets to 32 weeks before a scheduled caesarian section, where all babies were delivered safely, and the family got to return home six weeks later. She said: “It was incredibly chaotic bringing them home. You can’t imagine the crying and the running around for each baby and of course, still taking care of Zoey. “We hardly got any sleep and were awake every three hours for bottle feeds. “It’s hard enough with one newborn but with quads it’s four times as demanding. “But I also feel four times as blessed. “We’re so lucky that we have such a good support system here and we do get a lot of help. “It’s much easier now because they’re sleeping throughout the night. “I feel so lucky when I look at my children because I never thought this would happen to me.